In case you were unsure, Apple's Jony Ive is making it clear that the Apple Pencil is not meant to replace your finger. Speaking to design journal Wallpaper, Ive explained that it would be easy to confuse the role of the iPad Pro's Apple Pencil and the role of using your finger when it comes to iOS devices, but for Apple, there is a clear distinction. 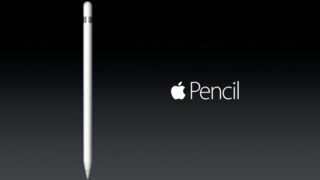 "I actually think it's very clear the Pencil is for making marks, and the finger is a fundamental point of interface for everything within the operating system," he said. "[W]e are very clear in our own minds that this will absolutely not replace the finger as a point of interface," he said, adding that the Pencil becomes a far better tool "when your focus becomes exclusively making marks." This distinction becomes important in that Apple is not positioning the Apple Pencil as a stylus, especially considering Steve Jobs was quoted to have said, "If you see a stylus, they blew it," back in 2010. "It was fundamentally important originally not to develop a user interface that required another instrument," Ive said in the Wallpaper interview. "It was important that we develop the UI based upon multi-touch, based on our fingers," he explained, while the Pencil becomes a device for those wanting to draw, paint or create things that require more precision than a digit. "What we found is that there's clearly a group of people that would value an instrument that would enable then to paint or draw in ways that you just can't with your finger," he said. "And I suspect that this isn't a small group of people."